Saturday, 9 May 2015 Day 0+ 212 days or 7 months post-transplant. I should update more often so that time doesn’t blend together as it has the last few months. We have been home just over 6 months now and so far recovery hasn’t been an easy road for Aaron (or our family). As predicted due to his high EDSS and his progressive MS Aaron has experienced an increase or exacerbation of existing symptoms (all completely normal). His 6 month MRI showed “no new lesions”! Those 3 words define Aaron’s primary outcome in getting HSCT; to halt progression of the disease. Statistics show that for people with PPMS with low ambulation (EDSS >6.0) 66 % population show stopping of disease activity but no substantial symptomatic reversal (improvement). Aaron is now a 7 on the EDSS scale and was a 6.5 on admitting in Russia. That said he has had some symptomatic improvement along with the increased disability. His hands still go icy cold but not as often, in fact they have times when they are warm now. His headaches are occurring less and less and when they do appear they are less intense and shorter in length. He has movement in both hands and all fingers but no feeling, they aren’t as strong as they were and the pins and needles are still there (but maybe not as intense). His speech is definitely clearer than it was prior to HSCT and he can concentrate a little longer (so long as he isn’t distracted or interrupted). We hope the next few weeks should involve some intensive inpatient rehab with OT, PT, Physio, and a Neuro based program. All essential for a productive recovery and to keep Aaron active and positive! In the meantime Aaron has a small routine to keep active as much as he can at home. He has no movement or strength in his left leg meaning walking is no longer possible but with assistance we are trying out a used rowing machine and I manually lift his leg to get the muscles going. All his bloods are still within range and at 7 months he should be over half way to building back his natural immunities. At 12 months he can begin re-immunisation. No, it hasn’t been easy and yes Aaron did get worse (his symptoms have exacerbated) but that does not mean HSCT did not work……HSCT has given Aaron time. He honestly has no regrets and would do it all again in a heartbeat to stop or even slow down the insidious disease that has invaded his brain and spine….. but he would do it a lot earlier so he had a better/slightly easier road to disability reversal! Tuesday, 19 May 2015 Day 0+ 222 days post-transplant. Good news update for Team AAMS: Aaron has admitted and begun Rehab! The hospital he is at accommodates patients with complex neurological conditions; it has world-class facilities and innovative programs tailored to the patient. He is in the best place to see the start of some great post HSCT improvements. Day 1 was a long day of testing and going through his goals and meeting all the different staff. He definitely seemed confident, a lot more comfortable and happier when I left him that afternoon. All the staff are really lovely and are primarily trained in Neurological rehabilitation (many have also had MS specific experience). He is in the ‘studio apartment’ on the ward which is the ‘independent living’ room for patients that are not dependant on staff for their daily needs. He has a separate kitchenette with fridge, stove, microwave and a dishwasher drawer! There is even a separate (and pretty large) lounge area with dining table and a fold out couch for family to stay when patients are preparing for going home ….it’s bigger than most hotel rooms we’ve been in! The main thing is that Aaron feels comfortable being there so that he can make progress. Day 2 was filled with Physio assessments and setting up a personal program to suit Aaron. He was fitted for an Ankle Foot Orthosis (AFO) to assist with his foot drop and they will also test out a few other assistive devices and show Aaron what is available. They provided him with a full size walker that is actually tall enough for him! Under guidance and with assistance he is up out of the chair and starting to move around, just a few steps at a time (doing the hip swing to move the uncooperative left leg) but he is standing up! His afternoon was filled with Neuro Physio, rest and a little socialising in the dining room. He is being pushed by the Physio and knows it won’t be an easy few weeks but it will be worth it!! A huge thank you to our ‘silent donors’ for making this possible – Stay tuned for more updates as the week progresses. He has had a very full week of Physio, Neuro Clinic, and Exercise Physiology as well as group activities including morning moves, brain games, quiz’s, move and groove and indoor bowls! That along with my daily visits and our walk/wheel around the grounds he is getting very involved and active in his rehabilitation; the results are shining through. He still has a lot of hard work ahead and will continue to give it 110% as he does with everything in life. One of the goals he has set is being able to be up on his feet walking with assistance around our home. His Physio’s believe this will be achievable over time with strengthening of muscles and working with them to find assistive devices that are most suitable for his needs. As well as helping him build skills to manage the fatigue he experiences from the exercising and getting his muscles active again. As many post HSCT’er have commented the ‘tiredness’ or fatigue is very different to MS fatigue that can come from doing nothing, this is being tired from activity! Week 2 will be another full week, an additional advantage of being in this facility; we have access to Dr.s, Physio and Dieticians with broader experience. In addition to all the same physio and neuro and exercise clinics, Aaron will also be seeing the Spinal Ward team. This will be helpful as they can assist with problems that are arising from being in the wheelchair and also other problems that MS damage is causing for Aaron. HSCT was not just a 30 day treatment – it is a 2 year + treatment and good rehab is another necessary part. 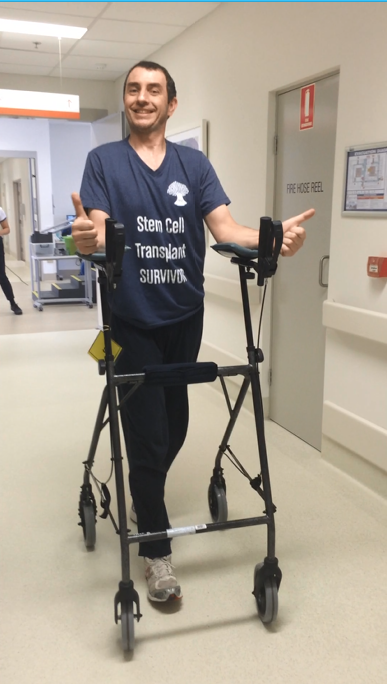 After the gruelling Chemo and a Stem Cell Transplant, it’s a great way to get Aaron back moving muscles in his whole body that he hasn’t used for a long time in a safe and supervised environment. I believe it could give his brain the opportunity to re-learn and maybe even re-program the communication that MS has stopped while he strengthens and conditions his body. There is no race and no finish line, post HSCT life is a roller coaster marathon. Saturday 30th May, 2015 Day 0+ 233 days post-transplant. One of the major benefits of being at Royal Rehab is that they have multidisciplinary programs that are designed to improve the functioning of patients who have neurological conditions. Aaron’s Physio’s are encouraging him to work smarter not harder in other words more quality than quantity. He tends to push too hard to beat his own results which isn’t the aim. He is motivated but needs to slow down as he has had a few days that he has crashed hard and the push has been too much. So now the team are concentrating on helping Aaron to strengthen his quads and hamstring muscles as well as reprogramming his brain to control those muscles using electro stimulation. He uses this under supervision during his clinics and has a routine for in the evenings. Dr Norman Doidge, A psychiatrist and researcher from the University of Toronto in Canada, put neuroplasticity in the spotlight in 2007 when he released his bestseller The Brain That Changes Itself. Neuroplasticity (also known as brain plasticity) refers to changes in neural pathways allowing the neurons (nerve cells) in the brain to compensate for injury and disease and to adjust their activities in response to new situations or to changes in their environment. The brain is not fixed and unchangeable, as was once thought, but can create new neural pathways to adapt to its needs. In conditions such as Multiple Sclerosis, Parkinson’s disease, Autism and Attention Deficit disorder, the brain’s general neuronal and cellular health goes awry. Aaron’s physios are right up on neuroplasticity and by using the electro stimulation and specific exercises are encourage his brain to rewire and re-learn to operate his left leg (which has been unresponsive for over 12mths now) and the messages are starting to get through! He has a lot of work ahead but as you can see in the attached video (taken on 29/05/2015 in his morning session) he is working hard and concentrating on making his left leg respond and get stronger. Saturday 6th June, 2015 Day 0+ 240 days post-transplant. It’s hard to believe that in 3 days it will be 8 months since Aaron’s Stem Cell Transplant in Russia! This time 12 months ago we were being interviewed on Aaron Attacks MS for the Hornsby Advocate, we had raised 30% of our financial goal and were about to appear on Ten Eyewitness News Sydney talking about MS, HSCT & The Aussie Russian Revolution! Time has both dragged and flown for both of us this past year but we are now beginning to see a brighter future. Aaron has spent the past 3 weeks as an inpatient at Royal Rehab Private in Putney and he honestly could not have been in a better place. The atmosphere is always positive and very conducive to setting and achieving realistic rehabilitation goals. All the teams work together closely to provide the best quality of care that encompasses the whole person. Together with an amazingly talented and dedicated Physio team, Aaron has been working on muscle strengthening, neuroplasticity, balance and coordination. 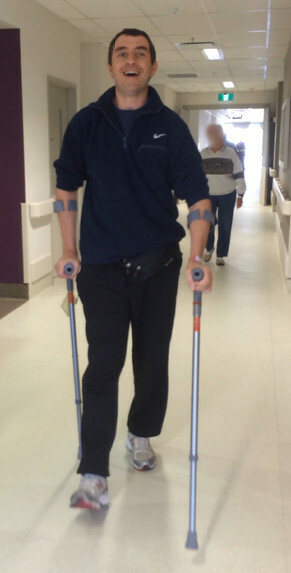 Over a period of 20 days, Aaron has progressed from walking short distances using a fully supportive walking frame & electro stimulation, to a self-supporting smaller frame and finally to standing alone with Canadian crutches! He is very fatigued after, but can now walk 15-20 mtrs with the Canadians and is even challenging the stair climb with just the rails. His walk is showing significantly less gait which is great to see as it makes the simple task of walking a little less strenuous and exhausting for him. His left leg is still essentially ‘lifeless’ (or in other words the nerves are not responding to the messages the brain is sending) but he has shown very positive results with help from electro stimulation. Aaron is now working on different ways of controlling the muscles that are in-active from MS nerve damage so that he can walk short distances without too much exertion or strain. He has shown amazing results with thanks to an awesome Physio team and his sheer determination not to stop! As well as daily Neuro Physio and Physio Clinics, Royal Rehab Private provide recreational activities that are designed around Aaron’s personal goals as well as his strengths and weaknesses – meaning he is exercising physically and mentally whilst socialising and enjoying himself! He has become competitive during the evening Mind Games and has really enjoyed having access to the Return 2 Sport organisation including attending an introductory class for Table Tennis and having a lesson and short ride of a recumbent tricycle! An active mind and body = great rehab! He is also working on improving his cognitive processes and becoming more aware of the effects MS has increasingly had on him over the past 2-3yrs. He is accepting the challenges and learning to work smarter not harder, both physically and mentally. Aaron will be coming home this Tuesday (8 months to the day from transplant) – YAY!! He will continue as an outpatient for Physio, where together they will continue to work with him on strengthening his weakest points. There will be follow up appointments for a few months with Dr’s and the Social Worker and he has the option to return as an inpatient in the future to build on his goals and/or help him reach the goals he will set for himself over the next few months. What an amazing facility – the teams they have working there go way above and beyond! Good Mood, Good Food, Good Rehab is just what Dr F ordered on discharge from Pirogov. With thanks to our amazingly generous ‘silent donors’ the help of all the awesome Doctors, Nurses, Physios, OT’s, Social Worker, Patient Care Coordinator, Nursing Assistants, Student helpers, Admin staff, cleaners and every single person we have had dealings with at Royal Rehab Private we have ticked all the ‘Good’ boxes and can now see a much brighter future. We know the HSCT roller coaster ride is far from over. I’ve said it before and I will say it again, HSCT was not just a 30-35 day treatment, it will be at least a 2yr chapter in our journey…..and we will continue to face it head on with our heads held high, positive attitudes and a determination to make the best of what we’ve got! ‘Don’t be afraid to fail ……. Be afraid not to try’! Thank you to the Doctors, Nurses, Physios, OT’s, Social Worker, Patient Care Coordinator, Nursing Assistants, Student helpers, Admin staff, cleaners and every single person we had dealings with during Aaron’s 21 day stay at Royal Rehab Private. Special thanks to the amazing Physio Team for your outstanding care and dedication – your hard work along with Aaron’s perseverance & tenacity showed results and made all the difference to his stay. & HaPpY 8 MoNtHs WaRRioR AaRoN! During his time at Royal Rehab under the guidance and assistance of the brilliant physio staff Aaron has begun to slowly learn to walk again! Through the use of electrostimulation on his quads and hamstrings, neuroplasticity training and many hard sessions working on muscle control and brain stimulation, Aaron is achieving some excellent results. Walking with his canadian crutches is now part of his daily physio sessions as he learns to concentrate on activating the muscles in his left leg encouraging them to respond to the messages he is sending. The messages don’t always get thru but he continues to work smarter not harder to reach his current goal of being out of the wheelchair for short periods each day. For Aaron reaching his goals has been both exciting and exhausting. He works hard during sessions and the concentration as much as the physical work takes a lot out of him. During his 21 days in RRC and continuing on now at home his goal is QUALITY over QUANTITY. Day rehab sessions are 3 times a week and we have a home program. Some days Aaron can get through our routine twice some days are only half sessions and some days fatigue will still get the better of him. It is all about managing the day and being sure to achieve QUALITY not quantity! Aaron is still immunocompromised (i.e. his immune system’s ability to fight infectious disease is compromised) and had his bloods checked regularly while he was in rehab. They continue to rise and fall as expected and his Haematologist as well as Dr Fedorenko are happy with his results. A journey of a thousand miles starts with a single step! Tuesday, 14th July 2015 – 9 months, 5 days post-transplant. The most common questions I get asked are possibly the hardest to answer simply “How is Aaron doing”, “How is he after rehab” or ”Is he improving after rehab”? I believe it is important to understand a few facts regarding HSCT, MS and what even I refer to as the “road to recovery” to ensure the answers are understood. 1. It isn’t a “recovery” like a healthy person would “recover” with rehab from an op or a procedure. Aaron’s “recovery” is from the chemo and the Stem Cell Transplant; as much as we wish he could “recover” from his Progressive MS, until they find the cure for MS (ie a way to repair the damaged myelin on the nerves) Aaron, Jake and I can only hope that he is in the percentage that do get the bonus round of symptomatic improvement…. 2. On admission to Russia Aaron was a 6.5 EDSS, he is currently a 7 with little to no mobility in his left leg. The pins and needles feeling is there constantly (when I asked him he said he forgets what normal feels like ) his hands & legs are both icy cold to the touch 99% of the time, it’s cold but he can’t wear a beanie on his head from the pressure feeling (even if it’s loose) and from the heat it generates. As with many people who are wheelchair bound he has bowel and bladder issues that are best not discussed here (although they are our daily reality….). His memory has not improved and he has cognitive issues and fog daily. He is fatigued and frustrated from dealing with mobility issues and internal issues and the mental strain of a day in his life….he is tired, grumpy and angry that this is happening to him. (All completely understandable as far as I see it given what a day in his life can be like). The only MS symptom I can confidently say has “improved” would be the massive headaches he was getting, although we could attribute that to being off Gilenya and or any other DMD for over 12 months now (not that there was any point in that as no DMD’s work for PPMS anyway…). 3. It has not been an easy road…..the rollercoaster that HSCT has been described as can have more dips for some than rises and that can be as hard on the recipient as the family supporting them. Unfortunately we are not the only ones on the ‘hard road’ after HSCT and we are sending out our thoughts and prayers to those that are doing it tough like us. Nope, it’s not all warm fuzzy stuff, some of us are struggling with the return of symptoms and increased EDSS, we are even a little disheartened as we aren’t seeing the ‘miracle’ results…… just like DNA, MS & HSCT, no two are the same, for some the benefits may only be stopping progression. There hasn’t been any jumping up from wheelchairs and running let alone just simply walking for some and sadly that is the reality of most things – for every positive result there are more often some not so positive ones too. It’s in the statistics, someone has to be in the lower percentage – that is of course until it’s 100% then it will be a cure! –> The statistic “probability” for late Progressive MS (non-ambulatory) treated patients (ie Aaron) of stopping MS disease progression is 75.5% vs 83.3 % in Relapsing Remitting MS (RRMS). –> PPMS treated patients with an EDSS >6.0 improvement is likely to be poor, if at all whereas 81% of RRMS patients experience “significant” improvement (>1.0 point EDSS) & reduction of existing symptoms. Many RRMS HSCT-treated patients report their symptoms completely disappearing. (A possible explanation of this finding could be the prevalence of degeneration in PPMS over inflammation in RRMS/SPMS). ** In all cases of MS no matter the type where HSCT is the chosen treatment it is recommended as early as possible before the onset of significant irreversibly progressive disability (unfortunately like Aaron…). The aim of HSCT for Aaron was to stop or at the least slow the progression of his aggressive MS, only time will tell if this is the case permanently. We do know for now that his 6 month post-transplant MRI showed no new lesions – meaning that at the least for now he can try to learn to deal with his current disabilities and build his confidence and strength up without any new symptoms rearing their ugly head. Aaron chose HSCT as it has a far better chance of providing a positive beneficial effect compared to any (read every) other therapy worldwide. So far, no other curative therapy can even come close in accomplishing what HSCT has already scientifically demonstrated. We will forever be grateful for the HSCT opportunity that many others don’t have and we have just one regret…. that Aaron couldn’t get HSCT earlier while he had a lower EDSS and a better chance of disease reversal. That ship has sailed now so we must continue to fight on and try (as challenging and hard as it is) to learn to deal with this current situation. Rehab for Aaron has incorporated trying to build the strength back in the many unused muscles along with trying to encourage neuroplasticity through electro stimulation (encouraging messages to get thru where the MS is blocking them). He has had intermittent success with the electro stim, nothing has been consistent yet (which is disappointing for Aaron….) one day he will have great results and the next try no results. He has days that it is hard just getting out of bed & into the wheelchair, the days he has had falls on transfers are the worst…(the OT has advised that a suitable disability bathroom renovation would remove one danger but that is a whole other story!)…. on the harder days rehab for him is just going thru the motions and is obviously not as productive…..it’s a continual battle and it gets tiring – the days pass slowly and are not generally easy or MS free. Unfortunately HSCT was never going to be a miracle cure for MS – we are still waiting patiently for that to be found! Aaron will continue with Rehab twice weekly at RRC till next Friday the 24th, we will then be out on our own in the big bad world again and will be seeking the services of an Exercise Physiologist to continue to work with Aaron to keep him active. Even if it is only for an hour or so twice a week it is important physically as well as mentally for both of us. During his rehab he has exerted a lot more energy than he had in the earlier months after HSCT and this has meant his bloods are all back in the lower ranges, Dr F & our Haematologist assure us this is all normal and means the Chemo did its job. The other side of that coin is this is another reason for Aaron’s fatigue. On the days he isn’t at Rehab the Dr’s have prescribed rest and relaxation as well as a pretty gruelling bowel regime (oops I mentioned it again sorry!)….. We don’t really know what is around the next corner, over the next hill or what might happen in the next 15 months – all we can do is hang on for the ride, keep on going and hope for the best outcome possible. Stick with us, if anything we hope it gives people a small insight into what living with a chronic disease and seeking a treatment overseas to stop aggressive progression and the challenges can be like. Tuesday, 21st July 2015 – 9 months home! We have always known that HSCT is a minimum 2 year treatment. At nine months home tomorrow we are not even half way there yet. We have had months of highs and lows with more to come. There have been good times and some not so good times (all a part of the the well known HSCT roller coaster). With my steadfast encouragement and support and through all the challenges he has faced Aaron continues to show strength, courage and determination, always trying to give it his best. Sunday, 9th August 2015 – 10 months post-transplant. It has been 10mths today since Aaron’s transplant in Russia. Unfortunately MS is still dominant in our lives. Studies show that results can be seen anytime up to 2 years with the aim of HSCT to halt the progression and any symptomatic improvement is seen as the bonus round. In the early stages after returning home (while on high doses of steroids) Aaron felt what he believed were improvements (or a reduction in symptom effects). As the steroids wore off and Aaron began rehab it became apparent that his symptoms had not reduced and now his symptoms are worse than before going to Russia. His left leg is unresponsive without electro stimulation or during physio where he is using muscles but the messages are still not getting through, his right leg is getting weaker and less responsive, his hands are constantly numb and the cramping that had eased is coming back worse. His headaches are returning, he doesn’t sleep, his hands and feet are cold 95% of the time, he has internal issues caused by MS damage, his cognitive processing is failing him and his patience and resilience are thin. He is frustrated, confused and disappointed that what appeared to be instant results have not lasted. His greatest regret is not being able to get HSCT before the steep decline that happened while we were fundraising to get to Russia last year. “But his MRI said he had no new lesions”?? True, however in Primary Progressive MS “the MRI characteristics include a tendency to lower lesion loads and lower rate of new lesion formation” in other words people with PPMS can and do progress without new lesion load or any obvious lesion activity on an MRI. For Videos and more photo’s please visit: AaronAttacksMS Facebook Community page.